More than 200 world leaders met over the last few days at the United Nations’ Annual Climate Change Conference in Bonn to discuss how to fill in the details of individual countries’ pledges of the Paris agreement. And while the United States has clearly ceded its leadership role to China, Germany, France, Canada and others, there are clear signs that adopting an ambitious climate policy is smart for long-term economic prosperity. Economists across the political spectrum agree that the market alone will not solve climate change, because carbon pollution is still largely unpriced. From an ideal point of view, the optimal climate policy would be a global carbon price. If an appropriate and sufficiently robust global carbon price existed, with clear declining limits on pollution, no other climate policy would be needed. Unfortunately, such a carbon policy does not currently exist. So, in the absence of such a global pricing regime, what kind of climate policy is cost-effective? Each individual climate policy can be judged on its merits, and most typically show large economic gains, as the benefits of avoiding climate change far outweigh the costs. To understand the benefit of climate policy, we first need a sense on the magnitude of the climate damages that can be avoided. The current economic consensus view quantifies the social cost of carbon – that is the damage from emitting one ton of CO2 – at $42 per metric ton of CO2 emissions in 2007 U.S. Dollars based on work by the U.S. Government’s Interagency Working Group on Social Cost of Greenhouse Gases. And while estimating the full range of climate damages is a daunting task, new research indicates economists are getting much better at it. Recent empirical studies have started to expand and strengthen the quantification of climate damages based on improved statistical techniques. A recent study in Nature, for example, finds that a lack of climate policy would reduce average income by 23% by 2100. These empirical estimates indicate that the true social cost of carbon is a multiple of the estimates based on the integrated climate-economy models that the Interagency Working Group still relies on. Which is what leading researchers suspected all along. But what about the cost of climate policy? For many, the potential cost of enacting ambitious climate policy has become a powerful argument against taking any sort of action. So how can we tell if enacting climate policy is cost-effective? A first pass is to subject individual climate policy proposals to benefit-cost analyses that weigh the cost of the specific policy against the avoided climate damages using the social cost of carbon. For example, if the climate mitigation component of a renewable energy proposal costs less than the social cost of carbon, then the policy is good economics. On the flip side, failing to pass a benefit-cost test does not necessarily imply that a policy is not cost-effective. The social cost of carbon still only captures some of the damages, and future revisions will in all likelihood correct it upwards. Additionally, a policy might lead to important co-benefits beyond climate policy such as reductions in criteria pollutants that have negative effects on human health and the environment. The Clean Power Plan can serve as a good example to illustrate the argument. Using benefit-cost analysis based on the social cost of carbon, the EPA determined that the Clean Power Plan is a worthwhile investment, with net gains totaling billions of dollars. This is the case even when ignoring any non-climate co-benefits, and when using the lower consensus estimate for the social cost of carbon. Relying instead on the newly available climate impact estimates adds several billion dollars to the net benefits. Moreover, the evidence suggests that – contrary to what some claim – we can implement climate policy while growing the economy. While there can be small adjustment costs, climate policy also leads to lead to new opportunities and innovation. Patenting in clean technologies, for instance, is as vibrant as in biotech, translating into additional growth benefits for the economy as a whole. While there is uncertainty as to just how much CO2 levels in the atmosphere will rise, we know it will be more than ever before encountered by modern humans. And, we already know the economic impacts will be bad. The devastation from hurricanes Harvey, Irma and Maria—made worse by the impacts of a warming climate—will cost communities, taxpayers and insurance companies billions. But things could turn out much worse. Theoretically, catastrophic climate damages could be so high as to dominate any benefit-cost analysis. This as of yet unpriced uncertainty is a compelling reason to act, not to wait. How to quantify uncertainty with precision is still at the frontier of climate economics. A recent working paper at the NBER calibrates a climate-economy model to financial risk attitudes. The authors find that taking the uncertainty in climate impacts seriously will increase the social cost of carbon even more. Uncertainty taken seriously means ambitious climate policy today. At least that’s what unites groups on both ends of the political spectrum, from progressive environmentalists to Nobel-prize winning Chicago economists. The economic case for ambitious climate action is clear. With the right policies, the benefits of avoiding climate change far outweigh the costs. And in the absence of a price on carbon, the only question is: what are the right climate policy instruments? As EDF has long argued, political debates in climate policy must not be over the if, but the how. While hurricanes tend to be the most dramatic, other types of severe weather also cause billions of dollars in economic damages. During the first half of 2017 alone, nine weather events including hailstorms, flooding, and tornados racked up $16 billion in damages across several states. Climate change doesn’t cause hurricanes, but sea level rise and warmer temperatures make storms more destructive. 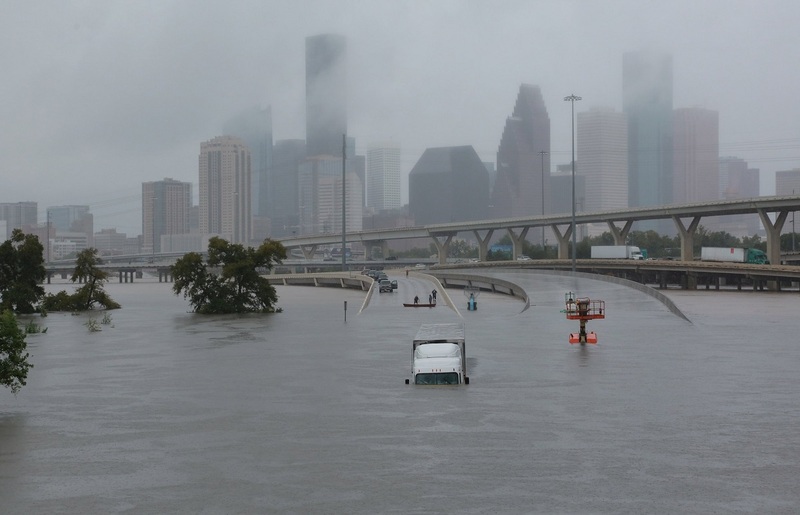 Storm surges along the Texas coast where Hurricane Harvey hit are now about 7 inches higher than storm surges a few decades ago as a result of sea level rise, which can make a big difference in flooding. In addition, evaporation intensifies with warmer temperatures, which results in more moisture in the atmosphere and therefore higher rainfall amounts and flooding when storms make landfall. Warmer ocean temperatures also fuel hurricanes, making them more powerful. Hurricane Irma was a classic example of just how powerful a storm can get from increased ocean temperatures. It is also possible that severe weather-related events overall are becoming more frequent. One recent EDF analysis shows that U.S. counties experienced, on average, a fourfold increase in the frequency of disaster level hurricanes, storms, and floods between 1997 and 2016 than in the 20 years prior. In the Southeast, this increase is even more pronounced; on average, its states experienced close to four-and-a-half times more disaster declarations over the same time period. In the coming decades, risk of climate change-influenced severe weather will differ from region to region, but one thing is clear: if left unmitigated, the effects of climate change could come at serious economic costs, not just to those who lose homes and livelihoods, but to their insurance companies or to taxpayers. Other aspects of the economy could experience significant pain as well. In the Southeast alone, higher sea levels resulting in higher storm surges could increase the average annualized cost of storms along the Eastern seaboard and Gulf Coast by $2-3.5 billion by 2030. In some areas, like Texas, where sea levels are rising faster than the global average, these increases even higher. Research published in Science suggests that even if storms themselves do not become more severe, direct annual economic damage could rise by 0.6 to 1.3% of state gross domestic product (GDP) for South Carolina, Louisiana, and Florida under median estimates of mean sea level rise. This translates into billions of dollars in additional economic damage every year for each of these states. During Hurricane Katrina, the extent of the damages suffered by Entergy New Orleans forced the utility into bankruptcy. Hurricane Irma caused power outages in Florida that left over six million people without power. Beyond these local impacts, these events can cause damage nationwide. Texas is home to about 30% of domestic oil and gas refining capacity, half of which was disrupted by Hurricane Harvey. This shut down 16% of the nation’s total refining capacity, spiked the average national gasoline price approximately 37 cents per gallon, and forced crude exports to drop from 749,000 to 153,000 barrels per day in the week after Harvey. As of September 10, 2017, more than two weeks after Hurricane Harvey made landfall, five Gulf Coast refineries remained closed, representing 11% of total Gulf Coast refining capacity and 5.8% of U.S. refining capacity. In the short term, the Trump administration should maintain existing programs designed to enhance U.S. energy security and disaster response. For starters, the administration should stop dismantling EPA programs expressly designed to help communities respond to damage from storms. In the long term, we need to build climate resilient communities and infrastructure, through efforts like wetland restoration and smart development. President Trump would also do well to listen to Miami’s Republican Mayor Tomás Regalado, and rethink his approach to climate policy. Instead of rolling back smart policies and regulations, or simply ignoring the impacts of climate change, we need to stop compounding the problem and mitigate the effects of a warmer climate through policy that sets aggressive emissions reduction targets. Such strategies will do much more than just protect our economy’s bottom line—it will help ensure the safety, security, and well-being of millions of Americans. What’s behind President Trump’s mystery math? By this time, your eyes may have glazed over from reading the myriad of fact checks and rebuttals of President Trump’s speech announcing the United States’ withdrawal from the Paris climate agreement. There were so many dizzying falsehoods in his comments that it is nearly impossible to find any truth in the rhetorical fog. 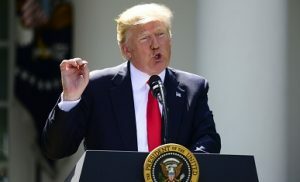 Of all the falsehoods, President Trump’s insistence that compliance with the Paris accord would cost Americans millions of lost jobs and trillions in lowered Gross Domestic Product was particularly brazen, deceptive, and absurd. These statements are part of a disturbing pattern, the latest in a calculated campaign to deceive the public about the economics of reducing climate pollution. Let’s be clear: the National Economic Research Associates (NERA) study underpinning these misleading claims was paid for by the U.S. Chamber of Commerce and the American Council for Capital Formation (ACCF) – two lobbying organizations backed by fossil fuel industry funding that have a history of commissioning exaggerated cost estimates of climate change solutions. When you pay for bad assumptions, you ensure exaggerated and unrealistic results. In the past five years alone, NERA has released a number of dubious studies funded by fossil fuel interests about a range of environmental safeguards that protect the public from dangerous pollution like mercury, smog, and particulate matter – all of which cause serious health impacts, especially in the elderly, children, and the most vulnerable. NERA’s work has been debunked over and over. Experts from MIT and NYU said NERA’s cost estimates from a 2014 study on EPA’s ozone standards were “fraudulent” and calculated in “an insane way.” NERA’s 2015 estimates of the impacts of the Clean Power Plan, which are frequently quoted by President Trump’s EPA Administrator Scott Pruitt and others, have also been rebutted due to unrealistic and pessimistic assumptions. The most important point embedded in this statement is that the study does not account for the enormous benefits of reducing the carbon pollution causing climate change. Climate change causes devastating impacts including extreme weather events like flooding and deadly storms, the spread of disease, sea level rise, increased food insecurity, and other disasters. These impacts can cost businesses, families, governments and taxpayers hundreds of billions of dollars through rising health care costs, destruction of property, increased food prices, and more. The costs of this pollution are massive, and communities all around the U.S. are already feeling the impacts – yet the President and his Administration continue to disregard this reality as well as basic scientific and economic facts. The statistics the President used were picked from a specific scenario in the study that outlined an impractical and imaginary pathway to meet our 2025 targets designed to be needlessly expensive, as experts at the World Resources Institute and the Natural Resources Defense Council have noted. The study’s “core” scenario assumes sector by sector emission reduction targets (which do not exist as part of the Paris accord) that result in the most aggressive level of mitigation being required from the sectors where it is most expensive. This includes an almost 40 percent reduction in industrial sector emissions – a disproportionate level not envisioned in any current policy proposal – which results in heavily exaggerated costs. The NERA study grossly overstates the changes in output and jobs in heavy industry. It’s not something you can cite in a presidential speech with a straight face … It’s being used as a talking point taken out of context. The NERA analysis also includes a scenario that illustrates what experts have known for decades – that a smarter and more cost-effective route to achieving deep emission reductions is a flexible, economy-wide program that prices carbon and allows the market to take advantage of the most cost-effective reductions across sectors. Even NERA’s analysis shows that this type of program would result in significantly lower costs than their “core” scenario. Not surprisingly, that analysis is buried in the depths of the report, and has been entirely ignored by the Chamber of Commerce and ACCF as well as President Trump. Finally, the NERA study assumes that businesses would not innovate to keep costs down in the face of new regulations – employing pessimistic assumptions that ignore the transformational changes already moving us towards the expansion of lower carbon energy. Those assumptions rely on overly-conservative projections for renewable energy costs, which have been rapidly declining. They also underestimate the potential for reductions from low-cost efficiency improvements, and assume only minimal technological improvements in the coming years. In reality, clean energy is outpacing previous forecasts and clean energy jobs are booming. There are more jobs in solar energy than in oil and natural gas extraction in the U.S. right now, and more jobs in wind than in coal mining. The truth is that the clean energy revolution is the economic engine of the future. President Trump’s announcement that he will withdraw the U.S. from the Paris accord cedes leadership and enormous investment opportunities to Europe, China, and the rest of the world. His faulty math will not change these facts. 1. No analytical back up for almost $20 trillion of the $50 trillion. Off the bat, it’s clear that President Trump’s Plan relies on flawed math. What’s actually estimated in the report is $31.7 trillion, not $50 trillion, based on increased revenue from oil, gas and coal production over 37 years (this total includes estimated increases in GDP, wages, and tax revenue). The other roughly half of this “$50 trillion” number appears to be conjured out of thin air. An average oil price of $100 per barrel and of $5.64 per thousand cubic feet of natural gas (Henry Hub spot price) was used to calculate overall benefits. Oil prices are volatile: in the last five years, they reached a high of $111 per barrel and a low of $29 per barrel. They were below $50 a barrel a few days ago. A $5.64 gas price is not outrageous, but gas prices have mostly been below $5 for several years. By using inflated oil and gas prices and multiplying the benefits out over 37 years, the author dismisses any volatility or price impacts from changes in supply. There’s no denying oil and gas prices could go up in the future, but they could also go down, and the modeling in the IER report is inadequate at best when it comes to tackling this issue. The IER report is overly optimistic when it comes to the amount of oil and gas that can be viably produced on today’s restricted federal lands. Indeed, the report assumes that recoverable reserves can be exploited to the last drop over the 37-year period based on estimates from a Congressional Budget Office report. A deeper look reveals that these estimates are actually for “technically recoverable resources,” or the amount of oil and gas that can be produced using current technology, industry practice, and geologic knowledge. While these resources are deemed accessible from a technical standpoint, they cannot always be produced profitably. This is an important distinction as it is the aspect that differentiates technically recoverable from economically recoverable resources. The latter is always a smaller subset of what is technically extractable, as illustrated by this diagram from the Energy Information Administration. The IER report ignores basic industry knowledge to present a rosier picture. When economists evaluate the economic benefits of a policy that has impacts well into the future, it is common practice to apply a discount rate to get a sense of their value to society in today’s terms. Discounting is important to account for the simple fact that we generally value present benefits more than future benefits. The IER analysis does not include any discounting and therefore overestimates the true dollar-benefits of lifting oil and gas restrictions. For example, applying a standard 5% discount rate to the $31.7 trillion benefits would reduce the amount to $12.2 trillion. The IER report suggests that the $31.7 trillion would be completely new and additional to the current status quo. This is false. One must compare these projections against a future scenario in which the restrictions are not lifted. Currently, the plan doesn’t examine a future in which these oil and gas restrictions remain and still produce large economic benefits, while protecting the environment. Another significant failure of IER’s report: even if GDP growth was properly estimated, it would not account for the environmental costs associated with this uptick in oil and gas development and use. This is not something that can be ignored, and any serious analysis would address it. We know drilling activities can lead to disastrous outcomes that have real environmental and economic impacts. Oil spills like the Deepwater Horizon and Exxon Valdez have demonstrated that tragic events happen and come with a hefty social, environmental and hard dollar price tag. The same can be said for natural gas leaks, including a recent one in Aliso Canyon, California. And of course, there are significant, long-term environmental costs to increased emissions of greenhouse gases including more extreme weather, damages to human health and food scarcity to name a few. These factors fundamentally undercut President Trump’s promise that Americans will reap the benefits of a $50 trillion dollar future energy industry. Most importantly, the real issue is what is being sacrificed if we set down this path. That is, a clean energy future where our country can lead the way in innovation and green growth; creating new, long-term industries and high-paying jobs, without losing our bedrock environmental safeguards. If the administration plans to upend hard-fought restrictions that provide Americans with clean air and water, we expect them to provide a substantially more defensible analytical foundation. It’s reported that the Trump Administration is poised to continue its barrage of attacks on some of our most vital health and environmental protections, following last week’s assault on broadly supported fuel economy and greenhouse gas safeguards for cars and light trucks. Here’s one attack that they may try to sneak under the radar—a move that would undercut common sense climate protection all across the federal government: directing federal agencies to abandon the use of social cost of carbon estimates in their evaluation of new policy. The social cost of carbon is a measure of the economic harm from the impacts of climate change. Specifically, it’s the dollar value of the total damages from emitting one ton of carbon dioxide into the atmosphere. Weakening or eliminating the use of the social cost of carbon would result in skewed and biased policy-making that ignores the benefits of crucial safeguards and stacks the deck against actions to protect communities from the mounting costs of climate change. The devastating impacts of climate change on health and the environment – such as extreme weather events, the spread of disease, sea level rise, and increased food insecurity – can cost American businesses, families, governments and taxpayers hundreds of billions of dollars through rising health care costs, destruction of property, increased food prices, and more. Many of these impacts are already being felt by communities across the country, as the government’s leading scientific agencies have found. When the federal government develops policy affecting the carbon pollution causing climate change, it is both reasonable and essential that it takes these costs into account. The social cost of carbon is a tool that allows policy-makers to do just that. Currently, the federal government uses a social cost of carbon estimate—roughly $40 per ton of carbon pollution—that was developed through a transparent and rigorous interagency process, relied on the latest peer-reviewed science and economics available, and allowed for repeated public comment as well as input from the National Academy of Sciences. But that may not last much longer. As we’ve seen, the Trump Administration is waging war against an array of our most crucial health and environmental protections, ignoring the urgent threat of climate change while prioritizing fossil fuel interests. President Trump’s new Administrator of the Environmental Protection Agency, Scott Pruitt, denies that carbon pollution is a primary contributor to climate change, and built his political career by suing EPA 14 times as Oklahoma Attorney General to block protections from mercury, arsenic and smog pollution, hand in hand with the worst elements of the fossil fuel industry. Meanwhile the Administration is proposing devastating cuts to the budgets for EPA and climate research, and is moving towards revoking the Clean Power Plan, America’s first-ever nationwide limits on carbon pollution from power plants. All of this points to a clear disregard for basic science, economic principles, and our nation’s clean air laws. Eliminating or weakening the social cost of carbon is another pernicious tactic by the Administration to undermine the development of crucial climate safeguards – by erroneously making it appear as though reducing carbon pollution has little or no benefit to society and the economy. Even the current figure is very likely a conservative lower bound since it does not yet include all of the widely recognized and accepted impacts of climate change. The details of the upcoming attack are still unclear. It’s possible that the Administration may end use of the uniform social cost of carbon estimate at the federal level—despite its rigorous basis and judicial precedent. Other indications suggest that the Administration may choose to artificially and arbitrarily discount the costs of climate change for the health and economic well-being of our kids, grandkids, and future generations—ignoring the growing consensus among economists that supports valuing these impacts more, as does a recent report from the Council of Economic Advisors. Or the Administration may decide to disregard the fact that our greenhouse gas pollution has harmful impacts outside U.S. borders that can have costly repercussions for Americans. Throwing out the social cost of carbon may play well with President Trump’s supporters in the fossil fuel industry. But the importance and appropriateness of accounting for these costs is a matter of both economics and law. We also know that nearly two thirds of Americans are concerned about climate change. Undermining limits on pollution—protections that are rooted in rigorous scientific research, reflecting long-standing bipartisan economic principles—will ultimately harm the health and environmental safety of all Americans, including Trump’s supporters. In the first Risky Business report, a bi-partisan group of experts focused on the economic impacts of climate change at the country, state and regional levels and made the case that in spite of all that we do understand about the science and dangers of climate change, the uncertainty of what we don’t know could present an even more devastating future for the planet and our economy. 1. Electrify the economy, replacing the dependence on fossil fuels in the heating and cooling of buildings, vehicles and other sectors. Under the report’s scenario, this would require the share of electricity as a portion of total energy use to more than double, from 23 to 51 percent. 2. Use a mix of low- to zero-carbon fuels to generate electricity. Declining costs for renewable technologies contribute in making this both technologically and economically feasible. 3. Become more energy efficient by lowering the intensity of energy used per unit of GDP by about two thirds. Of course, there would be costs associated with achieving the dramatic emissions reductions, but the authors argue that these costs are warranted. The report concludes that substantial upfront capital investments would be offset by lower long-term fuel spending. And even though costs would grow from $220 billion per year in 2020 to $360 billion per year in 2050, they are still likely far less than the costs of unmitigated climate change or the projected spending on fossil fuels. They’re also comparable in scale to recent investments that transformed the American economy. Take the computer and software industry, which saw investments more than double from $33 billion in 1980 to $73 billion in 1985. And those outlays continued to grow exponentially—annual investments topped $400 billion in 2015. All told, the United States has invested $6 trillion in computers and software over the last 20 years. This shift would also likely boost manufacturing and construction in the United States, and stimulate innovation and new markets. Finally, fewer dollars would go overseas to foreign oil producers, and instead stay in the U.S. economy. The authors also foresee an impact to the U.S. job market. On the plus side, they predict as many as 800,000 new construction, operation and maintenance jobs by 2050 would be required to help retrofit homes with more efficient heating and cooling systems as well as the construction, operation and maintenance of power plants. However, job losses in the coal mining and oil and gas sectors, mainly concentrated in the Southern and Mountain states, could offset these employment gains. As we continue to grow a cleaner-energy economy, it will be essential to help workers transition from high-carbon to clean jobs and provide them with the training and education to do so. Such a radical shift won’t be easy, and both business and policy makers will need to lead the transition to ensure its success. First and foremost, the report asserts that the U.S. government will need to create the right incentives. This will be especially important if fossil fuel prices drop, which could result in increased consumption. Lawmakers would also need to wean industry and individuals off of subsidies that make high-carbon and high-risk activities cheap and easy while removing regulatory and financial barriers to clean-energy projects. They will also need to help those Americans negatively impacted by the transition as well as those who are most vulnerable and less resilient to physical and economic climate impacts. Businesses also need to step up to the plate by auditing their supply chains for high-carbon activities, build internal capacity to address the impacts of climate change on their businesses and put internal prices on carbon to help reduce risks. To be sure, this kind of transformation and innovation isn’t easy, but the United States has sparked technological revolutions before that have helped transform our economy—from automobiles to air travel to computer software, and doing so has required collaboration between industry and policymakers. We are at a critical point in time—we can either accelerate our current path and invest in a clean energy future or succumb to rhetoric that forces us backwards. If we choose to electrify our economy, reduce our reliance on dirty fuels and become more energy efficient, we will not only be at the forefront of the next technological revolution, but we’ll also help lead the world in ensuring a better future for our planet.